Aside from being the gateway to the magnificent natural attractions of the reef and rainforest, Cairns is a sophisticated city in its own right; a waterfront city framed by the Coral Sea and the Great Diving Range. Much of the holiday accommodation is close to shops, restaurants, theatres, galleries and nightclubs. 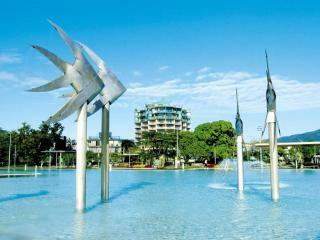 The Esplanade is a major focal point of Cairns City, inviting you to relax on the grass beside the sparkling blue waters of Trinity Inlet. The Beaches of Cairns stretch for 26km along a beautiful coastline, which begins just north of the city. Here you'll find all the ingredients for an idyllic tropical holiday; warm seas, watersports and miles of uncrowded sand with a sweeping backdrop of rainforest mountains. The beaches are made up of Holloways, Yorkeys Knob, Trinity, Kewarra, Clifton, Palm Cove and Elllis Beaches. Together the beachside towns provide much of the city's holiday accommodation, including mainland resorts and holiday apartments. Palm Cove is located 20 minutes from Cairns and offers a charming village atmosphere with a range of accommodation to suit all budgets. 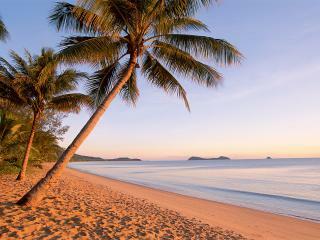 Palm Cove is a holiday destination with first class restaurants, indulgent spas and boutique shopping. Many of the regions attractions are easily accessible from Palm Cove with most tour companies providing courtesy transfers. With the picturesque palm tree lined beach and warm waters year round you can understand why Palm Cove is one of Australia's premier beach holiday destinations. Picturesque Port Douglas, hub of the reef and rainforest coast, is just 70 kms north of Cairns airport along a spectacular scenic coastal drive. From the stunning sweep of its 4 Mile Beach to the wilderness of Dicksons Inlet, the world famous seaside village of Port Douglas has become an international holiday mecca. Sharing the same tropical latitude as Tahiti, Port Douglas has a "laid back" low rise tropical old world charm, with an extensive range of accommodation and world class restaurants and shopping. The rainforests of the Wet Tropics of Tropical North Queensland offer an inspiring natural experience. In this setting is the quiet unspoilt Daintree village which nestles in a bend of the green waters of the mighty Daintree River. Crossing the Daintree river, visitors follow the road which winds its way north through pristine rainforest. The Daintree offers a diverse range of excellent tourist accommodation, from self contained rainforest backpacker hostels and lodges to luxury resorts and cabins. Some 250kms west of Cairns is the Gulf Savannah, otherwise known as the "Outback By the Sea". For travellers, accommodation comes in various options, camping grounds, caravan parks, self drive motor homes, modern motels and lodges and even rail carriages! Road conditions are sometimes hazardous, and impassable in the wet or "green" season. The Gulf is a spectacular and remote region, and one of the last really unexplored areas in the world. 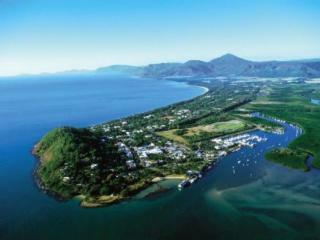 The islands of Queensland, are Australia's crown jewels, with a choice of accommodation and activities for all budgets. From the remote and secluded lodges of Haggerstone Island and elegantly sophisticated resorts of Lizard Island, Orpheus Island and Green Island. 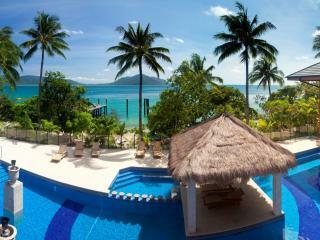 Try family oriented island getaways like Daydream Islands, budget conscious and party islands like Fitzroy Island. Islands are perfect for honeymooners, families, divers, beachcombers and nature lovers - that's everyone.